Persons transferred to the RPF are only transferred with cause. They are individuals who are R/Sers, low OCA nonproducers or repeated stat crashers and overt product makers, and have caused considerable trouble for themselves and the organizations they have been involved with. Hence, a person entering the RPF executes certain waivers to safeguard the Church against any claim or upset, should such ensue, as a first step before effecting his own redemption. These waivers make it clear that the individual is undertaking the program on his own responsibility and volition and that he holds no one else culpable for accidents or occurrences on the RPF. Transaction of the waivers as well as participation in the program are fully voluntary and anyone who does not wish to sign the forms or follow the program exactly may terminate his membership in the Sea Organization. Thus, before the SO member can participate in the RPF in lieu of offload, he must understand the purpose and intention of the RPF as covered in RPF Flag Orders and be fully apprised of the course he will be required to follow, of his own volition, toward redemption. Two waivers are to be signed. The first is called the ACKNOWLEDGMENT OF RPF ASSIGNMENT AND ELECTION TO PROCEED. The individual will be given this form for signature upon receipt of his assignment and before routing onto the RPF. This will be handled by the HCO of his org. No one may be admitted into the RPF who has not signed this form. After the person has arrived in the RPF and has studied the RPF FOs, he is then given the APPLICATION FOR PARTICIPATION IN THE RPF AND GENERAL RELEASE. 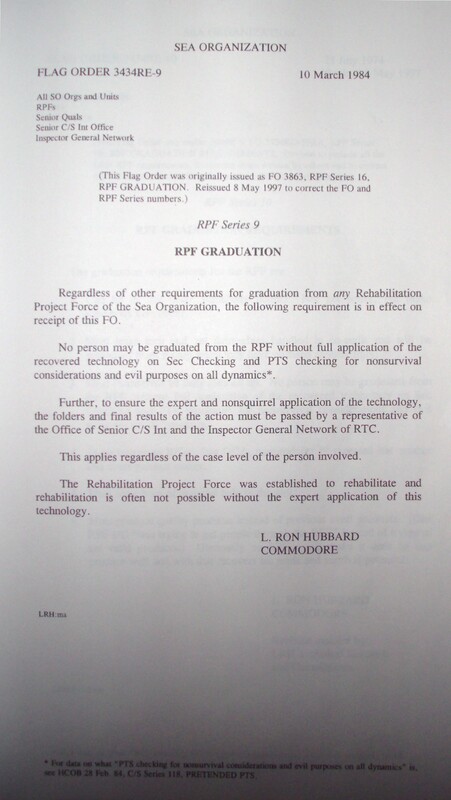 This document may only be signed after the person has a full understanding of what the RPF program involves and has read all of the RPF Series and attests he fully understands the series. The Cont A/Legal Aide is responsible for verifying with local counsel that the waivers are valid under local laws. Should any changes be needed, the A/Legal Aide is to CSW these to Legal Aide OSA Int for approval prior to implementation. 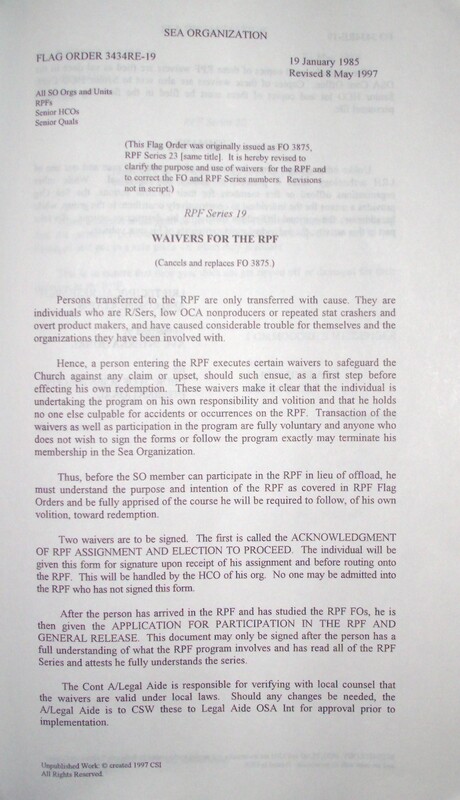 The original signed copies of these RPF waivers are filed as val docs in the OSA Cont Office. Copies of these waivers are also sent to Senior HCO Cont, Senior HCO Int and copies of them must be filed in the Sea Org member’s personnel file. 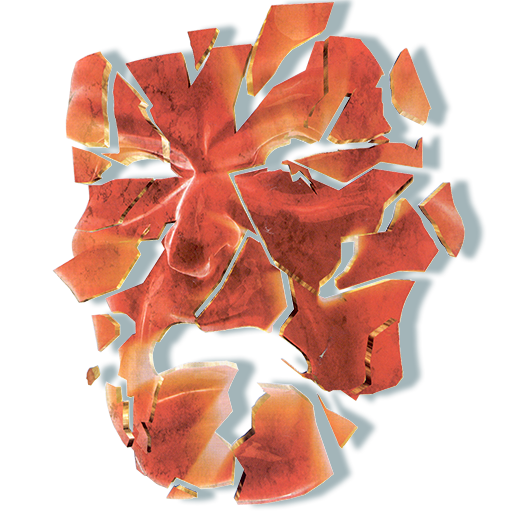 Unlike other groups, our understanding of the nature of man and our use of LRH technology make it possible to salvage an individual. While other organizations offload or fire members for their harmful actions, the Sea Org provides a means for the individual to constructively contribute to the group, while he addresses the spiritual difficulties that led to his destructive actions. To take part in this activity, the individual must participate of his own volition. Regardless of other requirements for graduation from any Rehabilitation Project Force of the Sea Organization, the following requirement is in effect on receipt of this FO. No person may be graduated from the RPF without full application of the recovered technology on Sec Checking2 and PTS checking3 for nonsurvival considerations and evil purposes on all dynamics*. Further, to ensure the expert and nonsquirrel application of the technology, the folders and final results of the action must be passed by a representative of the Office of Senior C/S Int4 and the Inspector General Network of RTC. This applies regardless of the case level of the person involved. The Rehabilitation Project Force was established to rehabilitate and rehabilitation is often not possible without the expert application of this technology. 1. Approval by the Senior C/S over the RPF (not in the RPF). 2. Once approval is given, the folders are then forwarded to the Office of Senior C/S International. 3. 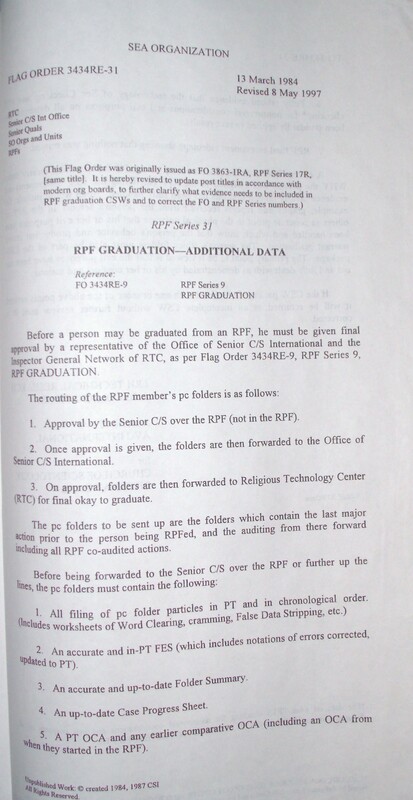 On approval, folders are then forwarded to Religious Technology Center (RTC) for final okay to graduate. The pc folders to be sent up are the folders which contain the last major action to the person being RPFed, and the auditing from there forward including all RPF co-audited actions. 2. An accurate and in-PT FES (which includes notations of errors corrected, updated to PT). 3. An accurate and up-to-date Folder Summary. 4. An up-to-date Case Progress Sheet. 5. A PT OCA and any earlier comparative OCA (including an OCA from when they started in the RPF). 6. Fully tabbed evidence that the technology of Sec Checking and PTS checking* for nonsurvival considerations and evil purposes on all dynamics has been standardly applied to rave results. 7. RPF final assessment videotape showing that nothing was missed. A cover CSW is to be placed on top of the PT folder which clearly states WHY the person was assigned to the RPF (including the RPF assignment) and evidence clearly tabbed that this has been fully handled. Such would include for example, graphs and reports received from the person’s seniors in the RPF or others as concrete proof in the physical universe that his or her evil purposes have been handled and which show that the person’s behavior and production record warrant graduation. 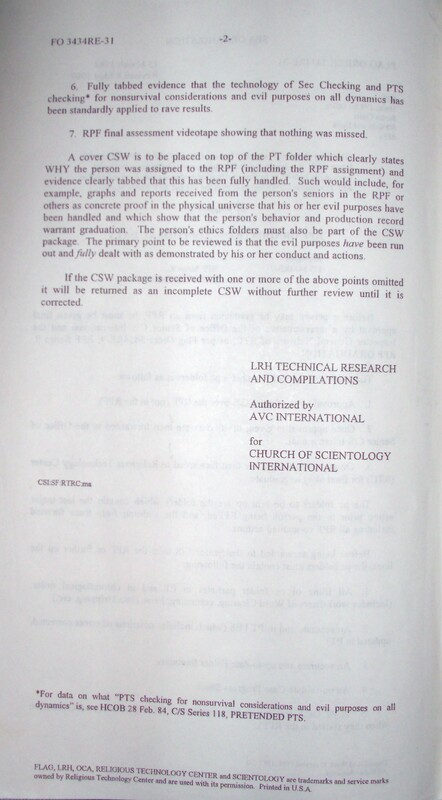 The person’s ethics folders must also be part of the CSW package. The primary point to be reviewed is that the evil purposes have been run out and fully dealt with as demonstrated by his or her conduct and actions. If the CSW package is received with one or more of the above points omitted it will be returned as an incomplete CSW without further review until it is corrected. It is evident that asking directly for evil purposes as part of Sec Checking has been knocked out of use over the years by SPs. It recently occurred that, in using Sec Checking to clean up several persons who had gotten into ethics trouble on their posts, a peculiar phenomenon and pattern came to light. The persons being handled had been asked for “overts” before and had “gotten them off” but would continue committing the overts. In each case they had blamed their difficulty on having been the effect of false data and black PR fed them by bad hats long since detected and removed from the area. However, these particular cases did not straighten out with de-PTSing actions. These persons were then asked directly for evil purposes and this action finally got to the root of the matter. a. They “get off overts” but then continue committing them. b. When overt products and flaps in their areas get investigated, they palm it off as having “gone effect of others’ black PR or false data.” In other words, the person appears to be PTS. c. They manage to convince those doing the investigating that that’s the end of the investigation. d. If something flaps, they get off some overts and start the cycle again at (a). In other words, they were actively committing suppressive actions while pretending to be PTS. And were busy making people around them feel PTS. While apparently the effect of suppression or black PR, they were actually generating it themselves: originating black PR to cover their own overt acts. What had been omitted in the handlings these persons had gotten previously was the full follow-through, because routine PTS tech would of course not handle someone who was on the other side of the coin—and by pursuing it all the way through, it would have exposed the pretense. We have in the (a) through (d) sequence above, the exact mechanism by which i such people skid through the lines undetected. This may explain a great deal to many executives who have ordered staff handled and then have had to conclude that the tech didn’t work because the staff wasn’t handled. What had actually occurred is that evil purposes had been omitted from Sec Checking tech with malice aforethought and that PTS checks did not include checks for evil purposes. This sequence shows the exact “failure” to handle people in RPFs, etc. In handling a PTS, the C/S must monitor the person’s progress closely. This means inspection of all interviews and session worksheets, observing the results of each PTS handling action, his change of position (or lack of) on the Chart of Human Evaluation as evident from the pc folder and so forth. If the person is not making change, or repeatedly slipping into further out-ethics behavior, the C/S must recognize this. It is, possibly, the (a) to (d) sequence above in action. If the C/S suspects this to be the case, his action is to begin to handle the case with Sec Checking by a competent Sec Checker. And such Sec Checking must include questions about the person’s purposes and intentions. Handled standardly in this way, the person can be expected to experience tremendous relief and case change. If a person is progressing well on a de-PTSing program (such as PTS interview, PTS RD, Suppressed Person RD), is making change, keeping his personal ethics in and moving up the Chart of Human Evaluation, then it would be a C/S error to suddenly interject a Sec Check into his program. None of this sets aside standard ethics and justice procedures. Such a person as would be found with a pretended-PTS situation is quite likely already under some justice action, and in fact doesn’t deserve immediate handling other than what HCO deals out. Some executives have gotten in the frame of mind that it is a waste of time trying to handle a bad hat. It is true the bad hat probably doesn’t deserve to be handled but it is nevertheless true that we do have the tools to handle one. We’re not out to handle the insane, but whether we like it or not we live in a pretty insane civilization. Any data which handles that or amplifies it technically or solves it is of course extremely vital. Hubbard, L. R. (1984, 28 February). Pretended PTS. 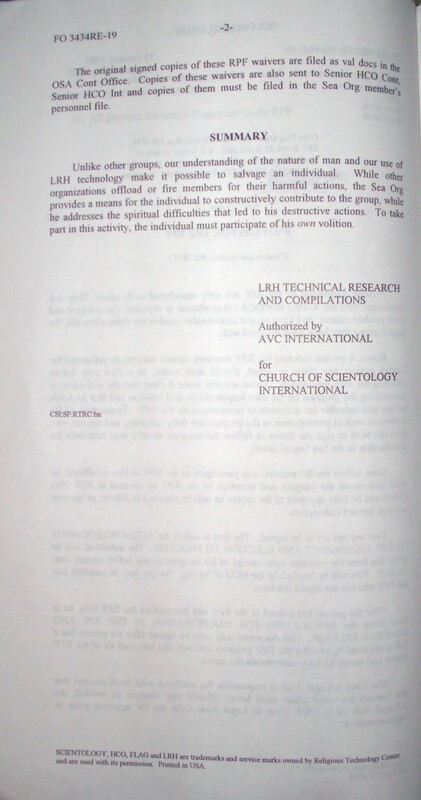 The Technical Bulletins of Dianetics and Scientology. (1991 ed., Vol. XII, pp. 547-549). Los Angeles: Bridge Publications, Inc.
We have in the (a) through (d) sequence above, the exact mechanism by which such people skid through the lines undetected. This may explain a great deal to many executives who have ordered staff handled and then have had to conclude that the tech didn’t work because the staff wasn’t handled. What had actually occurred is that evil purposes had been omitted from Sec Checking tech with malice aforethought and that PTS checks did not include checks for evil purposes. Also, it is important that the Ethics Officer advise the D of P when a staff or public person is undergoing an ethics or justice action so that this can be noted in the person’s pc folder. In this way, the C/S can also find out if the pc has landed in ethics trouble. (Ref: HCOB 13 Oct. 82, C/S Series 116, ETHICS AND THE C/S) If the person is not making change, or repeatedly slipping into further out-ethics behavior, the C/S must recognize this. It is, possibly, the (a) to (d) sequence above in action. If the C/S suspects this to be the case, his action is to begin to handle the case with sec checking by a competent sec checker. And such sec checking must include questions about the person’s purposes and intentions. None of this sets aside standard ethics and justice procedures. Such a person as would be found with a pretended PTS situation is quite likely already under some justice action, and in fact doesn’t deserve immediate handling other than what HCO deals out. 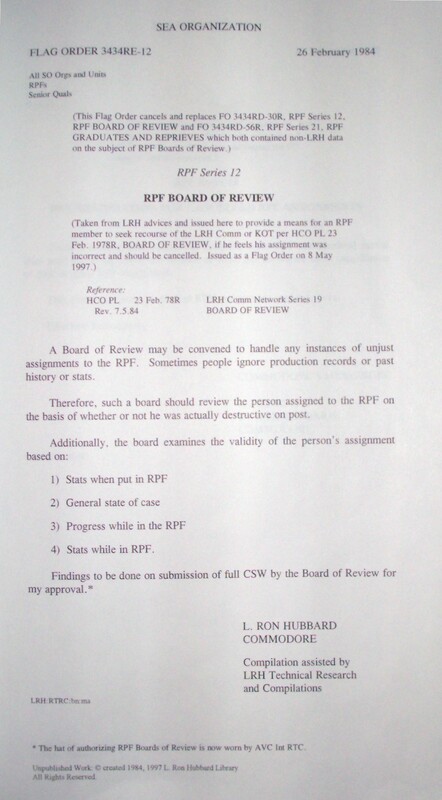 A Board of Review may be convened to handle any instances of unjust assignments to the RPF. Sometimes people ignore production records or past history or stats. Therefore, such a board should review the person assigned to the RPF on the basis of whether or not he was actually destructive on post. 4) Stats while in RPF. * The hat of authorizing RPF Boards of Review is now worn by AVC Int RTC.